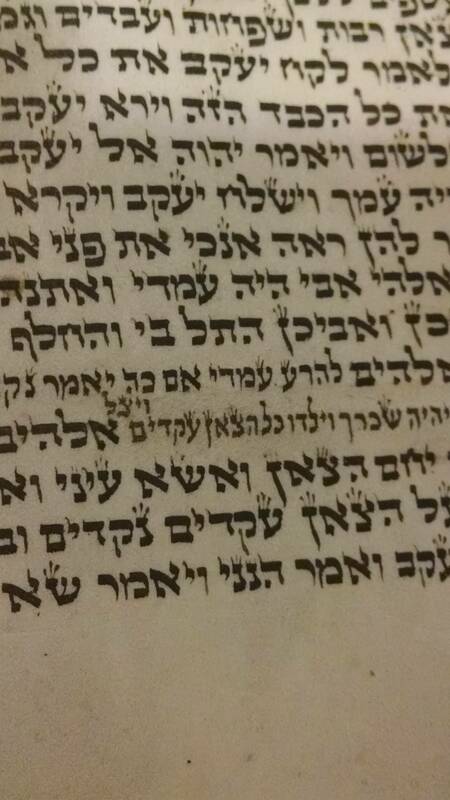 One of the Torah's in my shul has this interesting safrut style. Note that the last word of the verse appears between the lines. It seems that the Sofer (scribe) ran out of room, and stuck in the last word. I asked my rav to explain this. He's not a safrut expert, and, neither of us had ever seen anything like this. He surmised that the word immediately before and immediately after the correction (the full correction is in much smaller script than the surrounding text.) is Elohim which is one of G-d's names. The rav explained that one is not allowed to erase G-d's name unless there really is an error in the Torah in that name. So, the sofer was limited to correcting things in that limited space, but it still seems that he ran out of space when arriving at the last word. [If a scribe] erred and skipped a word or more -- he can hang it between the lines but not in the space between the columns. Seems like you guys basically figured this one out. It looks like the scribe accidentally skipped a line, and since he couldn't erase God's name, he had to squeeze two lines worth of text into one line. He ran out of room and hung the last word between the lines. Obviously not an ideal situation, but still kosher (in theory, though I'm not making any rulings on that particular scroll based just on half a picture; indeed when hanging a missing word one is generally supposed to start it just above the beginning of the next word, not centered over the gap between words as in your picture). Remember even when hanging words between the lines the letters still need to be formed properly. Also there are various restrictions regarding the amount one can hang between the lines and regarding writing God's name in this fashion. Not the answer you're looking for? Browse other questions tagged safrus .